Not from a Box: Kitty loves ice cream... and pie! I don't know how he knows. If it's a slice of pizza or a sandwich, he doesn't bat an eye. But if I've got a bowl of ice cream or, as of today, a slice of grasshopper pie, Sabriel comes running. I'll hear the metal tag on his collar jangle oh-so slightly as he runs down the hall. If I'm sitting on the couch, he'll jump onto the back and investigate by leaning down over my shoulder to sniff what goodie I'm procuring. If I'm sitting at the computer, he'll hop into my lap and situate himself between me and the dish, his nose busily trying to figure out what I've brought him. Either way, he'll be purring loudly even before he reaches me. What it is about these sweet treats that gets his motor running? He's a rather finicky cat. Apart from dry food and the occasional treat, the one food he'll bother eating is canned tuna. These days, he comes running when he hears a can being opened, reminding me of Hobbes in Calvin and Hobbes, and always manages to get completely underfoot. (Too bad when it's just garbanzo beans!) He generally only really likes green tea ice cream and chocolate anything: ice cream, pudding, cookies. He won't actually eat the pudding or the cookies, but he still comes to check it out. 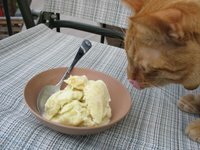 When it's ice cream, he'll lick a little bit of the melted remnants off a spoon before feeling satified and disappearing. And now with this pie! (Which, by the way, has improved even more after sitting in the fridge for a couple days.) Maybe it was the chocolate crust, but he did get a tiny taste of green grasshoppery goodness off my fork. I guess that's cats for you, though: you never can quite figure them out. Cats are interesting creatures. Glad you understand.